growth plate scar to angle, BLUE ARROW ON IMAGE). Using a dedicated surface coil and small field of view, coronal T1 imaging evaluates bone marrow signal (e.g., increased in avascular necrosis) and the relationship of the osseous structures to each other (e.g., scapholunate disassociation). Inversion Recovery is sensitive to pathological fluid as may be seen in an occult scaphoid fracture. Coronal spoiled 3D gradient fat suppressed sequences are capable of very thin slice thickness which are especially well suited to imaging the small structures of the wrist. Gradient sequences also evaluate the cartilage. Axial T1 evaluates the tendons of the wrist and carpal tunnel, including the flexor retinaculum. Axial PD fat suppressed evaluates the tendons of the wrist and carpal tunnel, including the median nerve. Sagittal T1 evaluates the tendons, bone marrow and relationships between the osseous structures. 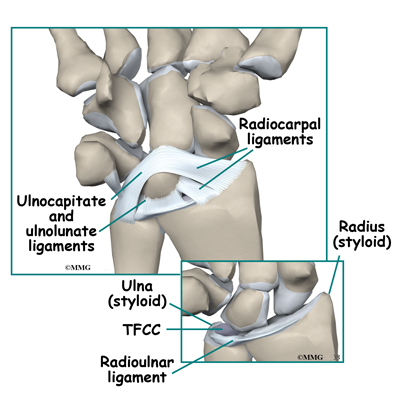 With a radio-carpal compartment injection, post intra-articular T1 fat suppressed sequences evaluate the integrity of the interosseus ligaments and triangular fibrocartilage. There are two bones in your forearm (the part of your arm between your elbow and your wrist). These are called your radius and your ulna. Your radius is on the thumb side of your wrist and your ulna on the little finger side. In your hand, you have eight small bones known as your carpal bones. They are arranged in two rows one on top of the other. The proximal row is the row that is closest to your body. In the proximal row are your scaphoid, lunate, triquetrum and pisiform bones. The distal row is the row below this. In the distal row are your hamate, capitate, trapezoid and trapezium bones. 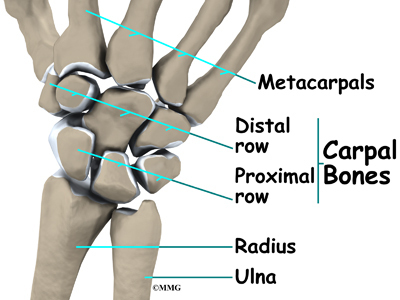 Your scaphoid bone is one of the largest of your carpal bones and is on the thumb side of your wrist. It looks a bit like a cashew nut and is roughly the same size. It links the two rows of carpal bones together and actually helps to stabilise them. Your scaphoid bone and your lunate bone articulate (connect) with your radius at your wrist joint.